Join Author Cynthia Kocialski on her Virtual Tour September to November, sponsored by The YP Publishing. From September 3 through November 3, Cynthia will discuss new, smart, innovative strategies to transform product ideas into new business. She will show you how to demonstrate that a business is viable, learn today’s most powerful strategy to build your proof of concept and to gain customers. Imagine if start-ups were made on a production line and defect rates were this high, the line would be shut down until the problem identified and a solution mapped out. Clearly, conventional wisdom on how to create a new business isn’t working. It is definitely time for a new approach. The Your Start-Up Company as a Business Experiment video series and e- book discuss why a standard business plan does not work; how to create a concept plan and a business experiment; how to use business experiments to prove these theories and gain a better understanding of your target market and customers; common mistakes businesses make; the system need as an entrepreneur, one that will allow you to discover the right product and the right business model for your market; and how to attract investors. 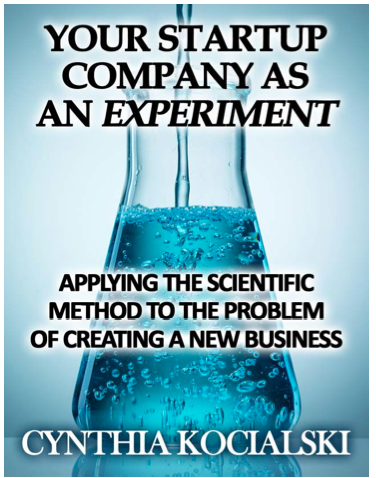 For a look at Cynthia’s full tour schedule, go to http://cynthiakocialski.com/blog/your-start-up-company-as-a-business-experiment-virtual-tour/ and http://www.udemy.com/your-start-up-company-as-a-business-experiment. There will be contests and giveaways during her tour. We can’t wait to see you there!